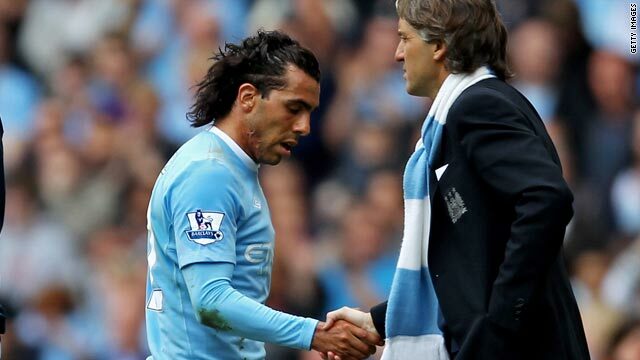 Carlos Tevez shakes hands with manager Roberto Mancini, who he has criticized, after being substituted on Saturday. (CNN) -- Tottenham and Manchester City remain locked in a battle for England's fourth Champions League berth after both clubs won crunch clashes on Saturday. London club Tottenham will go into Wednesday's showdown between the two teams with a one-point advantage after beating 14th-placed Bolton 1-0 at home thanks to a fierce strike from midfielder Tom Huddlestone seven minutes before halftime. If Spurs win, their final match of the Premier League season at relegated Burnley will be meaningless. City, who will have home advantage, need to at least draw and then win at West Ham -- and hope Tottenham lose. Harry Redknapp's team may be without Brazilian goalkeeper Heurelho Gomes, who suffered a groin injury. The Tottenham manager said he would not seek special dispensation for a reinforcement as City did in replacing the sidelined Shay Given last week. Manchester City, who started with emergency loan keeper Marton Fulop rather than risk young Faroe Islander Gunnar Nielsen, kept their hopes alive after coming from behind to defeat Aston Villa 3-1, ending the Midlands side's chances of claiming fourth place. Norway striker John Carew gave visiting Villa the lead in the 16th minute, but Carlos Tevez -- whose City future is in doubt after criticizing manager Roberto Mancini's training methods -- leveled from the penalty spot in the 41st minute for his 29th goal of the season before a frantic end to the half. Carew then hit the bar but young winger Adam Johnson immediately set up striker Emmanuel Adebayor for City's second goal. City pressed for a third goal, which came in the final minute as substitute Shaun Wright-Phillips set up striker Craig Bellamy. Mancini, who was given a remit of finishing the season in fourth place when he replaced the sacked Mark Hughes, outlined the importance of Wednesday's match. "It's going to be a final. We wanted one final this year and we have it," the Italian told reporters. "Now we must win against Tottenham, we have to play like we did today, we must be strong. Everton's hopes of winning a Europa League place ended with a 0-0 draw at Stoke, meaning David Moyes' team cannot catch seventh-placed city rivals Liverpool, who host leaders Chelsea on Sunday in a match which will have a major influence on the title race. Chelsea lead champions Manchester United, who travel to mid-table Sunderland, by a point with two games to play. Birmingham moved six points clear of 10th-placed Sunderland with a 2-1 win over Burnley, while bottom club Portsmouth finished their home season with a morale-boosting 3-1 win over Wolverhampton ahead of the May 15 FA Cup final against Chelsea.